This article was originally published in The Tribune newspaper. Last year, I reviewed the excellent We're Alive – a podcast telling the story of a zombie virus breaking loose and bringing about the end of the world... mostly. That followed the story of a few survivors as they tried to make their way in this post-apocalypse world. 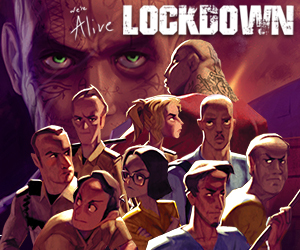 For those wanting to take a dip into the same world but without the huge number of episodes, there's now a new spin-off, Lockdown, six episodes long and following the view of the end of the world from inside the walls of a prison. The production is excellent, great voice actors and some genuine scares even in this slow beginning. If you want a horror story on the radio, here's a great place to start. The Black Tapes is a docudrama following host Alex Reagan as she sets off on a paranormal investigation – starting with Dr Richard Strand, a ghost hunter who doesn't believe in ghosts. She uncovers his store of VHS tapes... and the horrors that lurk within. Fictional, of course, but the show presents itself as a documentary, with Reagan detailing her investigation as she goes along in the fashion of a radio show, with interviews with a medium and other individuals she encounters along the way. There's two seasons of the show so far – and bear with the first episode, it takes a while to get going... until a door on a video tape slowly creaks open all by itself. Then, things get weirder... and scarier. Away from the scary stories themselves, there's a wealth of podcasts chatting about the horror genre – and Night of the Living Podcast is one of the longest established of those. It's great fun, its format is essentially a bunch of friends sitting around and chatting about horror – then picking a straight to video movie to praise or pillory before moving on to something more mainstream. A recent show focused on the movie Trace – about a group of young people experimenting with Electronic Voice Phenomena when everything goes wrong, including – according to the NOTLP team – the script, the characters and everything else with the movie. They gleefully rip apart the movie, with spoilers galore because, as they say, if it's a rubbish movie, they'll tell you everything to save you the trouble. They then move on to the Louis Gossett Jr classic Enemy Mine and share what they loved about the movie – plus lots of little nuggets of information about the movie. Bad Guy #2 in the movie who we can't remember his name? He ends up being executive producer of the Paw Patrol cartoon. Parents, you know you're singing that theme tune now. There's a great love and affection by the hosts for their genre – and this particular show was also filmed in front of a live audience too, so there's plenty of banter. Just beware of some fruity language from time to time.